Jia Zhangke, a leading member of China’s “Sixth Generation” of filmmakers, started off in the 1990s making “underground” films, without government support or authorization. He finally got state approval with The World (Shìjiè, 2004) and then worldwide recognition with Still Life (Sanxiá Haorén, 2006), which won the Golden Lion at the 2006 Venice Film Festival. The physical setting for Still Life is the Three Gorges region along the Yangtze River, one of the most spectacular scenic areas in China. But the focus of the film is not on that beautiful natural setting, but on manmade squalor produced by the construction of the Three Gorges Dam that the ordinary people of that region had to cope with. In particular, the action is focused on the city of Fengjie, a 2,300-year-old city that was located upstream of the newly constructed dam and was in the process of being demolished in preparation for its being flooded by the dam’s reservoir waters . 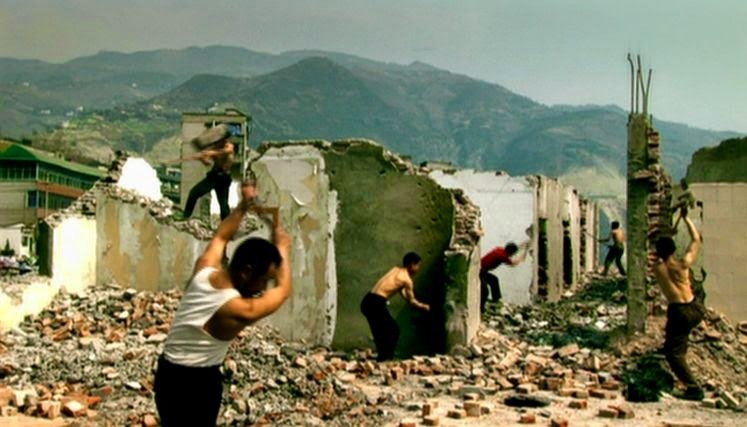 Some people may think of Still Life as almost an ethnographic coverage of working class people in that area of China, but I would say that the film is much more than that . It is an atmospheric mood piece that reflects not so much a natural environment but more like a dystopian nightmare that the people in this film are living through. And the principal characters in the film are essentially just animated (barely) signposts to that relentless nightmare. I will allude to some of these below. A critical factor to how all this is presented is Jia’s deceptively low-key cinematography. Frequently using long and medium-long shots with slow pans, he embeds his characters in a heavy environment of industrial desolation and human-made decay. This is enhanced by ambient noises that tend to engulf and dominate the human participants. One might be tempted to think that Jia is merely passively documenting the reality of Fengjie’s disintegration, but there are many carefully composed and choreographed shots, some lasting more than four minutes in duration. The whole effect reminded me somewhat of Antonioni’s Red Desert” (1964). Han Sanming (played by Han Sanming) a coal-miner who has come to Fengjie from his home in Shanxi province (Jia Zhangke’s native province) to look for his wife and daughter whom he has not seen for sixteen years. His wife’s brother lives in Fengjie and may know their whereabouts. Shen Hong (Zhao Tao) a young woman, also from Shanxi, searching for her husband who had come on his own to Fengjie two years earlier. Han Sanming, a laconic working-class visitor to Fengjie in search of his long-missing wife Missy Ma, upon arrival hires a motorcycle to take him to the last address he has for her, only to find that the entire street is now submerged by the newly constructed dam’s backwaters. He then manages to find her brother, “Brother Ma”, who is laboring on a river boat in town. The two men are so taciturn that there is almost no information exchanged during a shot lasting 3:40 – even Han’s awkward offer of liquor is barely acknowledged by the sullen Brother Ma. But Han does learn that Missy Ma is working in a nearby town and might show up in a couple weeks or months. So he decides to stick around a bit and gets a job as an unskilled demolition worker. Staying at a cheap hotel for itinerant workers where the primary gesture for social interaction is lighting a colleague’s cigarette, Han meets “Brother Mark”, a more talkative sort who dreams of being a gangster, after the fashion of Hong Kong triad gangster film star Chow Yun Fat, in the demolition racket . The thoughtful and discerning Brother Mark, aware that bride-selling had long been a lucrative business for Fengjie, extracts from Han the fact that he had purchased his bride from Fengjie many years ago for the sum of 3,000 yuan. While walking outside, Han is only mildly interested in seeing a UFO or spaceship pass by in the sky. The otherworldly nature of Fengjie’s self-destruction is so bizarre and unnatural that even the sight of a UFO doesn’t seem very surprising. But this event is the transition to Act 2. The camera now pans down to Shen Hong who has also just arrived in town and has just seen the UFO. Also in this act there is another bizarre shot of expressionistic unreality like the UFO – this time a large building in the background is seen to takeoff like a rocket ship. Again the surreal depiction is merely atmospheric and has no significance with respect to the main events of the story. Anyway, Shen Hong finds her runaway husband’s former work place and takes some tea from his still-preserved desk that evidently reminds her of him and happier former times together. She then locates their mutual friend, Wang Dongming, who after some effort helps her find her husband, Guo Bin. 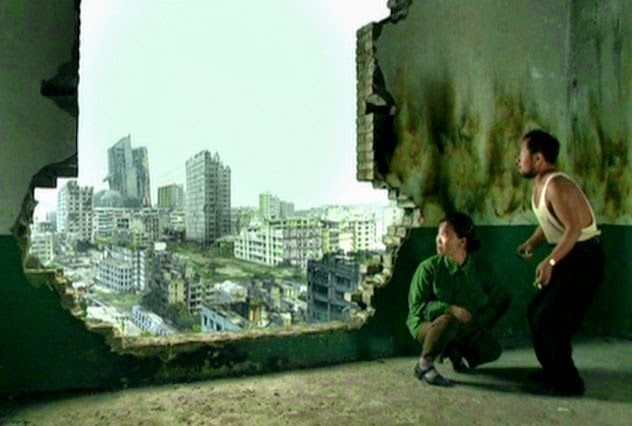 When Shen Hong and Guo Bin finally meet, their encounter is cold and emblematic of the pervasive lack of communication throughout this disintegrating environment. Guo Bin tentatively offers to embrace Shen Hong, but his weak gesture is almost offensively rude. Seeing this, Shen Hong tells him that she has found another man and wants a divorce. You can decide for yourself whether you think she really has a new love or is just fed up with Guo Bin. This entire encounter is encompassed in a single moving camera shot lasting 4:15. She walks disconsosately away from him, and so ends the Shen Hong story. When Han tells the boat owner that he wants to take Missy Ma away with him, he is informed that he will first have to pay off the 30,000 yuan debt. Han calmly calculates that it will take him a year working in the Shanxi coal mines to save up the money and says he will return for her in a year’s time. In the concluding scenes, Han is talking with his fellow itinerant unskilled workers. There is an extended session of drinking and lighting each other’s cigarettes as they display some degree of camaraderie in a single moving-camera shot of 4:14 duration. Hearing that the dangerous job of coal mining offers a better salary, they all say they want to go to join him in Sanxi province and work there. 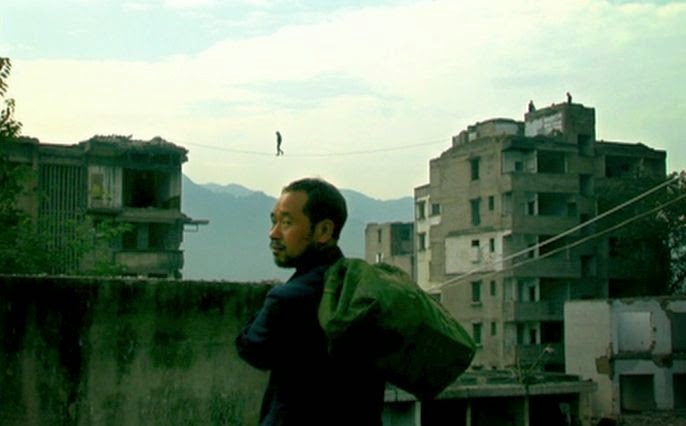 As they all move to a new hotel (their previous hotel having been condemned to demolition because it is to be flooded by the rising reservoir waters) Han idly watches an unlikely image of a man walking on a high tightrope strung between two buildings. This symbolizes the kind of fate that he and his comrades have been subjected to by the inhuman dislocations and disruptions of modern industrial China. I originally saw Still Life back when it was first released and thought it was just OK. When I recently saw it again, I appreciated it much more. Its mood catches up with you and eventually takes over. “Fengjie Vaporized for Three Gorges Project”, Xinhua News Agency, November 4, 2002. Acquarello (with “Alsolikelife”), “Still Life, 2006", Strictly Film School, February 4, 2007.